Corrosion is a relatively slow material degradation process to which metallic structures of aircraft are subjected during service and it can appear in many forms. Generally, corrosion protection for preventing or inhibiting the formation and growth of corrosion damage on aircraft structures is well-established technology. Unfortunately, despite preventive measures, corrosion does occur and its probability of formation significantly increases as structures age. Corrosion detection and characterization at the initiation stages, while hidden under paint or in concealed areas, still poses a challenge to inspection science and technology. Corrosion damage is costly and it carries the risk of loss of life as well as hardware in case of catastrophic failure. The authors are investigating the application of obliquely backscattered ultrasonic signals (OBUS) as a means of detecting and characterizing corrosion under paint in metallic panels. OBUS were measured using oblique insonification and were used to produce C-scan images of corrosion damage located on both top and bottom faces of test panels through the paint. A combination of OBUS data and a sensor-array real-time imaging (SARTI) system is being developed for field applications. SARTI uses Charged Coupled Device (CCD) to display ultrasonic data and the integrated system has the potential to reduce the need for paint stripping prior to inspection. The main features of the combined OBUS and SARTI are described in this paper. Military and civilian aircraft are being used in service significantly longer than their original design life. This cost driven trend is subjecting the structures of these aircraft to conditions that are increasing the probability of failure, particularly as a result of aging. Some aircraft models, which have already endured a long service life of about 40 years, are being considered for another 40 years of service. The need to be concerned about long usage of both military and commercial aircraft is a very well recognized fact. The 1988 failure of the Boeing aircraft that was operated by Aloha Airlines heightened the level of concern of aircraft manufacturers, users, and the Federal Aviation Administration (FAA) to the issue of aging commercial aircraft. While aging of military aircraft has not been in the spotlight of the media it is also a major issue that requires adequate attention and is of growing concern in contrast to the commercial side where new aircraft were introduced to replace the old ones. The potential increase of corrosion induced flaws initiation in aging aircraft structures has added a greater degree of urgency to the ongoing need for reliable and efficient nondestructive evaluation (NDE) methods for detection and characterization of flaws in aircraft structures. Corrosion detection at early stages of their formation suffers from low probability of detection and reliability. Aging of metallic structures is mostly associated with fatigue cracking, debonding and corrosion. Detection of fatigue cracks in primary structural elements is handled by existing NDE techniques that are applied periodically either during the scheduled maintenance or when a concern arises. The issue of debonds seems to be a manageable one since the old cold-bond is being substituted with a more durable bonding system. The kissing-bond flaw is being addressed by many investigators and will not be considered in this manuscript. On the other hand, detection and characterization of corrosion at the initiation stages, while hidden under paint or in concealed areas, pose a great challenge to the inspection science and technology. Corrosion damage is a costly source of damage to aircraft and it carries the risk of loss of life as well as hardware in case of catastrophic failure. Corrosion is a relatively slow materials degradation process to which metallic aircraft structures are subjected during service [Hagemaier, Wendelbo & Bar-Cohen, 1985]. It is a general term that describes the oxidative degradation of metals caused by a local galvanic cell between the base metal (acting as anodic sites), at sites of defective protective coating, having the passive sites sustaining cathodic reaction. The corrosion process converts the metal into its oxide or hydroxide forms resulting in deterioration of its mechanical properties. Corrosion in aluminum alloys and plated steel surfaces can often be recognized by dulling or pitting of the area, and sometimes by white or red powdery deposits. It may also be the origin of, or revealed by, delamination, cracking, metal thinning, fretting, etc. Corrosion can appear in many forms, depending on the type of metal, how it is processed, the surrounding structure and service conditions. Corrosion results from exposure to humid or corrosive environments and involves primarily electrochemical action at chemical/ metallurgical/physical heterogeneity, with dissimilar potentials. In Table 1, a list of corrosion types that may appear in aircraft metallic components, their sources of formation and by-products, is given. Galvanic Corrosion Corrosive condition that results from contact of different metals. Uniform damage, scale, surface fogging or tarnishing. Emission of mostly molecular hydrogen gas in a diffused form. Slow growth rate. Expressed as penetration/year or weight loss per unit-area/day, e.g. the rate for aluminum in open atmospheric conditions of Los Angeles, CA is 0.02- mil/yr. For Ti and Al alloys the rate is slow and therefore it does not pose serious structural problems. The metal with the most negative potential suffers the most damage. Pitting Impurity or chemical discontinuity in the paint or protective coating. Localized pits or holes with cylindrical shape and hemispherical bottom. Rapid dissolution of the base metal. Expressed in terms of pitting depth (i.e. pitting factor). Pitting can be critical to the structural integrity. Can be detected by AC impedance or electrochemical impedance spectra analysis. Usually pitting is accompanied by an order of magnitude change in the local resistance and capacitance. Thermo-galvanic Corrosion Caused by thermal gradients parallel to the metal surface. Localized attack correlated with temperature distribution. Produces scale indications. Hot portion of the metal serves as cathode whereas the cold portion as anode. Crevice Afflicts mechanical joints, e.g., coupled pipes or threaded connections. Triggered by local environment composition differences (O2 concentration). Localized damage in the form of scale and pitting. Same as scale and pitting. Difference in oxygen concentration produces potential difference and leads to flow of electrical currents across aerated (cathode) and derated (anode) portions of the metal. Stress Corrosion Cracking Mechanical tensile stresses combined with chemical susceptibility. Localized micro-macro- cracks at shielded or concealed areas. Produces initially scale type indications at a large magnitude that progresses to cracking. Causes critical failure of structures. Failure rate is determined by the stress levels. Corrosion fatigue occurs under cyclic stresses. Stress and rubbing action remove protection and lead to fretting corrosion as a result of contact of the metal surface with particles introduced by the abrasion process. Inter-granular Presence of strong potential differences in grain or phase boundaries. Appears at the grain or phases boundaries as uniform damage. Produces scale type indications at smaller magnitude than stress corrosion. The severity and rate of growth depends on the material microstructure crystalinity and segregation. This type of corrosion can merely result increased susceptibility to attack in the form of pitting or stress cracking. Exfoliation occurs in layered grains (e.g. rolled sheets) in the form of laterally extended damage. Aluminum is susceptible to such attack mainly in an environment of chlorine ions and dissolved oxygen. Microbial Bacterial, fungus or yeast in contaminated kerosene-type jet engine fuel. Appears in integral fuel tanks. Combination of the by-products of pitting and scale. Can be eliminated by a proper maintenance of the fuel in the tank. Filiform High humidity around fasteners, skin joints or breaks in coating cause an electrolytic process. Fine, meandering, thread-like trenches that spreads from the source. Similar to scale. Table 1: Corrosion types, which can inflict damage to aircraft strictures, and their characteristics. structures susceptible to protective treatment damage during installation and repair, abrasion, fretting, and erosion. Corrosion protection is well-established technology for preventing or inhibiting the formation and growth of corrosion damage in aircraft structures. Unfortunately, any mechanism of protection has a certain probability of failure, which includes removal of protective coating by abrasion, rubbing or impact. Thus, despite preventive measures, corrosion does occur and is mostly due to insufficient inhibitor, chipping of paint and Alclad or anodized layer from the part surface, or leakage of solutions into traps within structures. In spite of careful maintenance programs to assure a lower rate of progress of corrosion damage (proper sealing or cleaning in galley area, proper draining, etc. ), corrosion does occur and effective NDE techniques are needed to detect them as early as possible. Detection of each of the corrosion types described in Table 1 that can be induced in an aircraft metallic structure may require a different NDE approach due to the unique characteristics that are involved. Several NDE methods are widely used for corrosion detection and evaluation. When the inspected area is physically accessible, visual tests are commonly used for periodic checks. Sometimes, tools such as magnifying glasses or boroscopes are employed for further evaluation or for less accessible areas, respectively. The inspection involves a visual search for cracks, change of color, change of texture, or bulges. Surface corrosion at its embryonic stage can be visually detected from localized indication such as discoloration, faint powder lines, pimples on the paint and paint damage. Concealed corrosion is very difficult to detect since in most cases the characteristics of the damage are not sufficient to trigger an indication in conventional NDE tests. Generally, several NDE methods are available to detect and characterize hidden corrosion including X-ray and neutron radiography, ultrasonics, eddy current, and acoustic emission. All existing NDE methods for detection of corrosion are limited in capability and sensitivity. Frequently, corrosion is detected only after several subsequent inspection schedules, in which case the damage is fairly extensive and may require the replacement of the structural component involved. Fig 2: Oblique backscattering image of corrosion on the backside of an aluminum plate. Fig 3: Oblique backscattering ultrasonic waves (OBUS) setup. In 1979, the principal author of this paper pioneered the polar backscattering technique with his discovery that ultrasonic pulses backscattered from discontinuities can be separated from specular reflections by oblique insonification. Subsequent to this discovery, a joint Bar-Cohen and Crane study concentrated on NDE of composite materials [Bar-Cohen and Crane, 1982] and was followed by numerous other investigations. The method was named polar backscattering since the measured amplitude of the backscattered signals depends on the wave polar angle with the composite material fibers. A single transmitting and receiving transducer is used and the backscattered signals are monitored. The test sample is obliquely insonified to avoid receiving the specular reflections that have sizable amplitude and can mask the scattering from small discontinuities. Thus, it is possible to detect small flaws in a tested specimen. Using this approach for NDE of corrosion offers an effective method. Since there are various corrosion types and their severity varies with the spatial distribution inside the structure, it is essential to have the capability to map the damage and characterizing it. Further, detection of pitting type corrosion can be critical to the integrity of the structure under static and cyclic loading and it is much more difficult to detect this flaw using conventional NDE techniques. The experimental backscattering setup is shown schematically in Figure 1. A single transducer is used to transmit ultrasonic pulses and the test structure is accessed from a single side. The received signals can be used to produce a C-scan image of the part as shown in Figure 2, where corrosion on the backside of 1.6-mm thick aluminum plate is recorded. The test was done through the painted side using a 0.25-inch diameter 5-MHz transducer having 1-inch focal length. The transducer was tilted to induce 16.5° angle of incidence with the aluminum plate surface and the corrosion damage as shown in Figure 3. However, since this image is showing the amplitude variation, only the corrosion damage distribution over the tested area is visualized. Other information, such as the severity and depth distribution, could not be extracted at this stage without effective inversion technique of processing the backscattered signals. Such information may lead to the ability to map the extent of damage, determine the side at which the damage is located, image it and provide information about the damage severity. Backscattering is induced by discontinuities, which are present along the path of a traveling wave, with surface normal to the direction of the incident wave. This technique has been investigated for various wave interactions with discontinuities, including surface roughness, inclusions and various internal flaws [Chang and Mal, 1995, Oglivy 1991, El Azab and Mal, 1997]. These studies can provide some foundations to the proposed modeling effort. Generally, it is necessary to select an optimum incident angle for the given metallic structure to allow access to its other side and possibly through a second layer bonded to it. The potential use of two separate angles of incidence needs to be considered as a method of distinguishing between the front and rear surface corrosion. Beyond the second critical angle the received signals are received only from the front surface. The relation between the incident amplitude and the angle of incidence for a water/aluminum half-space interface is show in Figure 4. As can be seen in this Figure, reflections from the rear surface of the material or the bulk of the structure in case of exfoliation corrosion can be avoided using an angle of incidence above 30° . The proposed model will account for the paint layer and the potential thickness range that is practically being used in aircraft structures. Fig 4: Reflected and transmitted energy flux coefficient for water/aluminum interface. The basic theoretical model is depicted in Figure 5, where the ultrasonic wave is incident upon the multi-layered aircraft structural component shown. As indicated earlier, if there is no corrosion or other damage to the material, the wave interaction with the structure results in specular and non-specular reflections and no reflected energy is returned to the transmitting transducer. For flat layered or slightly tapered geometry, the reflected wavefield can be calculated by means of available standard techniques. If corrosion damage or other localized defects are present within the layered structure, then the waves are scattered by the defect and the scattered waves propagate away from the defect in all directions. Thus a portion of the scattered wave propagates back to the transmitting transducer. The location, shape and size of the flaw influence the characteristics of this backscattered wavefield, and a careful analysis of the backscattered wave can, in principle, provide information about the nature of the flaw. A hybrid finite element technique is currently being developed to sole the theoretical problem [Chang and Mal, 1998]. Fig 5: A schematic view of the wavefield in a painted 2-layer structure. Fig 6: A schematic view of a SARTI system operated in field conditions. 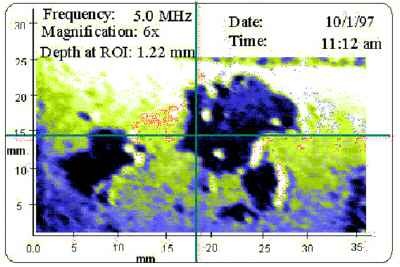 Fig 7: A pulse-echo image of corroded area in an aluminum plate visualized by the current SARTI system. The depth data represent the information at the crosshair cursor location. The field application of the OBUS technique can be done effectively using a portable real time imaging system that employs a two-dimensional sensing array. [Zhang (1992), Harrison, et al (1994) and Lasser & Harrison (1997)] displays images at TV frame rates. This capability contrasts the conventional C-scan, which generates the image by scanning the test area point-by-point. This real-time imaging system offers a portable, practical tool for rapid visualization of flaws using an integrated circuit, which converts ultrasound data into a standard TV output, enabling ultrasound C-scan imaging in real time. The system in its current form operates as a pulse-echo tester (as shown schematically in Figure 6) and it is designed to display different depth views by examining various ranges of time-of-flight. To employ SARTI, the inspector applies an ultrasound couplant over the desired test area. Then the probe assembly is placed against the target using the pistol grip and the ultrasonic wave insonifies the target area upon squeezing a trigger. The ultrasonic pulse-echo image of the test structure appears on a small LCD screen mounted on the back of the probe. Controls are located on the handle facing the user and real-time adjustments can be made to select the desired contrast, gain, ultrasound power, pulse-echo power, etc. An example of corrosion detected in an aluminum plate is shown in Figure 7. The SARTI system operates as an 'ultrasonic camcorder' and it employs imaging elements that are used in mature visible and infrared technologies. The detector consists of a two-dimensional piezoelectric microelectronic array of pixels that is read by a multiplexer at a rate of 30 frames/second. Mature electronic circuitry is used to format the images for presentation to the user, similar to a standard video camcorder. The use of commercial high resolution and high sensitivity microelectronic components allows making a low cost instrument, which is benefited from the rapid improvement of these components by the industry. The SARTI transducer is a broadband type that induces a wide and relatively uniform beam. The reflected signals are collected using an acoustic lens that focus the signal onto the IC array that is made of a PVDF layer that is bonded to the silicon IC with 128x128 active elements over each 1-cm2 area totaling over 16,000 elements (with 85-µ center-to-center spacing). The voltage generated at each pixel is transferred to the silicon CMOS multiplexer, which is designed to read the individual voltages sequentially, producing a TV like image. To examine array slices in the time domain, the received signals are 'range gated'. The SARTI unit can be programmed to examine time-of-flight bounds and thus producing 3D images of 'material slices'. Also, frames can be integrated to enhance the signal-to-noise or perform backscattering mapping. An RS170 TV signal is then frame-grabbed and coupled to a standard machine vision system that performs acceptance/rejection criteria, image enhancement, false color, image annotation, etc. The separation of the receiver and transmitter signals is done electronically. The SARTI system resolution can be adjusted with a minimum of 85-µ where the test area will be limited to 1-cm2 . The selected ultrasonic frequency of the transmitted signals and the magnification of the image can adjust the resolution of the SARTI system. Corrosion is a serious cost and safety concern to operators of aircraft made of metallic structures. Obliquely backscattered ultrasonic signals (OBUS) offer a highly sensitive NDE tool that can be used to detect and characterize corrosion at early stages. The damage can be detected under the paint as well as both on the top and bottom of the tested panel. The acquisition of the data and its image as a function of location using the sensor-array real-time imaging (SARTI) technique enables effective means of corrosion detection in field conditions. SARTI uses Charged Coupled Device (CCD) to display ultrasonic data and it can potentially aid in reducing the need for paint stripping prior to inspection. This capability can increase aircraft safety and make significant cost saving to aircraft operators. Further, decreasing the volume of paint stripping and repainting can also have a positive environmental impact in reducing pollution and wasted resources. The Jet Propulsion Laboratory (JPL), California Institute of Technology (Caltech) portion of the research was carried out under a contract with National Aeronautics Space Administration (NASA). Bar-Cohen, Y., and R. L. Crane, "Acoustic-Backscattering Imaging of Subcritical Flaws in Composites," Materials Evaluation, Vol. 40, No. 9 (1982), pp. 970-975. Chang, Z., and A. K. Mal, "A Global-Local Method for Wave Propagation Across a Lap Joint," in Numerical Methods in Structural Mechanics, ASME-AMD Vol. 204 (1995), pp. 1-11. El-Azab, A., and A. K. Mal, "A Perturbation Solution for the Interaction of Lamb Wave with Localized Surface Defects," NDE of Aging Aircraft, Airport and Aerospace Hardware, Proc. of SPIE Conf., Vol. 3397 (1998), pp. 76-86. Hagemaier, D. J., A. H. Wendelbo, and Y. Bar-Cohen, "Aircraft Corrosion and Detection Methods," Material Evaluation, Vol. 43, No. 4 (1985), pp. 426-437. Harrison, G.H., and E.K. Balcer-Kubiczek, "Uniform Pulsed Fields for Ultrasonic Bioeffect Experimentation," Ultrasonics, 29 (1991) pp. 264-267. Lasser, M., G. Harrison, "Real time, large area ultrasound imaging system using two-dimensional array technique," UT-online Journal, http://www.ndt.net/article/0398/lasser/lasser.htm (1997). Oglivy, J.A., "Theory of Wave Scattering from Random Rough Surfaces," IOP Publishing, Philadelphia, 1991. Zhang, X., G.H. Harrison, and E.K. Balcer-Kubiczek, "Exposimetry of Unfocused Pulsed Ultrasound," IEEE Trans. UFFC, Vol. 41 (1994), pp. 80-83.